How to make your own vegan mayo recipe that’s cheaper, tastier, and healthier than store-bought. When I ate eggs, I used to love to make my own mayo — it’s so much fresher and tastier than store bought. Now that I don’t eat eggs anymore, I was at a bit of a loss for how to replace mayonnaise. I mean, it’s kind of egg dependent, right? I’m sure Vegenaise is a great product but I try not to buy very many processed foods, vegan or not, so I set out to make my own. And wow, this was amazing! I honestly did not expect it to work, but it totally did! You just put soy milk (I’m not sure if it works with rice or other ‘milks’ yet, I’ve only tried it with soy so far) and oil (I used canola but you can also use safflower or grapeseed or probably most neutral oils) in a food processor and blend it up. It starts out as a sort of gross looking oil and milk blend, but as soon as you turn on the blender it puffs right up into mayonnaise! Add a splash of lemon juice and you’re really in business. It’s actually a lot easier than regular mayo even because you don’t have to slowly drizzle in the oil to get it to emulsify. This stuff was amazing on portobello burgers. The regular mayo would work perfectly for almost anything you’d use normal mayonnaise for – I’m sure I’ll be coming up with a few salads and other things that incorporate it soon. It’s vegan but just like regular mayo it’s pretty much made up entirely of oil, so I have to recommend using it sparingly if you’re trying to keep your diet low fat. I love when kitchen science works! 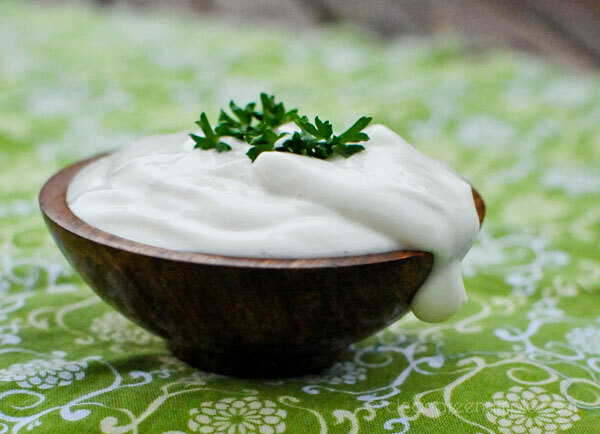 A creamy vegan mayo recipe that’s cheaper, tastier, and healthier than store-bought. Gluten free, raw, sugar free adapted Food.com recipe. Combine all ingredients except lemon juice (or vinegar) in the food processor or blender, blending until smooth. Slowly add the lemon juice or vinegar until the mixture thickens and tastes as desired. Add salt and mustard to taste. Wow! That’s a super easy recipe! I only have almond milk on hand. I wil let you know how it turns out with that. Oh my. This looks absolutely amazing! I will have to try this ASAP! And find something to put it on! You are fantastic! 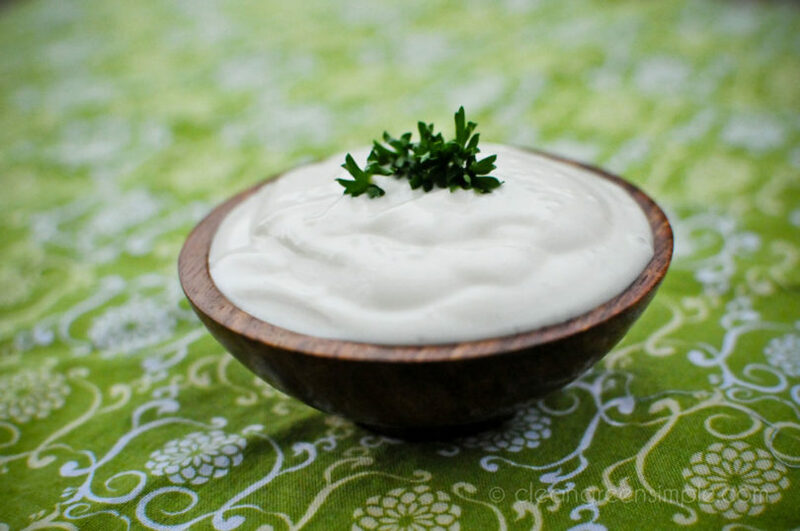 I’ve been looking for a simple and tasty vegan mayonnaise recipe ever since I moved to Switzerland and this looks and sounds awesome! Will try making it asap, thank you!! A fantastic find. I am going to try this as well using almond milk. I will also post on my Facebook Wall. Very useful recipe. How long can I keep it in the refrigerator? i used about 2tsp of apple cider vinegar but it still seemed a little thin, maybe because it was getting warm? will it thicken up in the fridge? It might thicken in the fridge a little, but if it’s thin it might be because your soy milk is a little thin? I try to use the thickest soy milk I can find 🙂 You could also try adding just a bit of cornstarch or arrowroot powder when you blend it to thicken it up. Let me know if it thickens in the fridge or if you figure something else out! I followed a very similar recipe recently and had the same problem with it being too thin. I really think it is the milk. I’m going to be trying this later today, but will use a thicker soy milk. Crossing my fingers it comes out as beautifully as yours 🙂 I’ll be back for an update! I also was thinking it might be something in the milk – the one I use is just soybeans and water, no additives or anything. Not sure if those would make a difference, but maybe! The milk made all the difference! I tried it before with an unsweetened almond milk and it just came out watery. I made this today with regular soy milk and it is PERFECT! So I think the issue is the milk – if you buy light soy milk or any type of milk that is pretty thin, I don’t think it will come out right. It tastes amazing by the way 🙂 Thanks again for the recipe!! THANK YOU! Thank you for posting this recipe. 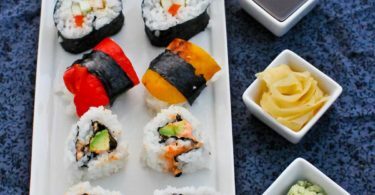 We have started eating vegan and I have been looking for a vegan recipe for mayonnaise.I am so happy that our daughter told me about your site! I’ve made this twice for potato salad – ( Curried Roasted Potato Salad – and it was marvelous. I even changed up the proportions a little bit and it worked well. I made soy milk from Better Than Milk powder and based on the other comments, I made it double-thick. I linked back to your recipe in my write-up. Thanks! WOW! I’m going to make this today! I’m actually planning to make sweet potato fries today and this would go perfectly; I’d prefer to make the Chipotle one but I don’t have the necessary ingredients, and it’s Canada Day so nothing’s open. Anyways, greetings from a Canuck! We’re not vegan or vegetarian but my son is highly allergic to eggs so I’m always looking for recipes that are egg free. Can’t wait to try this. He might start to like something other than bbq sauce on everything!!!! Which ingredient thickens it and how thick should it be? It’s the oil that thickens it, really, so if you want it to be thicker use more oil or less soy milk – it should be the same consistency as regular mayo. I want to try this with Silk creamer…..I love that stuff and use it for everything 🙂 I will let you know how it turns out. The creamer is french vanilla but I really can’t taste the french vanilla in it so I will let you know how it turns out, I also want to try and make your ranch dressing recipe 🙂 I am a new vegan and I am so happy I found your website! Great recipes! I tried this with unsweetened almond milk and it came out runny. I’m going to try again with soy milk and hopefully it’ll come out better. Today I made it the right way with the soy milk and it came out perfect. Just like real mayo! Unfortunately I was disappointed to see that the chipotle chillies with adobo sauce contained sugar (which is not vegan, unless it’s organic, because of the way it’s processed.) Next time I will look for organic chipotle chillies with adobo, if it exists. Thank you so much for this recipe! I’m sad to report that I’ve tried this recipe with every single suggestion, and all I get is an slightly thicker than milk mess 🙁 I am disappointed because it looks so yummy. Hmmm…I wonder why it’s not working for you? That’s too bad! Maybe try adding the oil, putting in a tiny bit of milk, blending, adding a tiny bit more milk, blending, etc? Then when it’s slightly thickened add lemon juice to make it thicken even more? Sorry it’s giving you trouble, it is yummy! Perfect! Thank you! 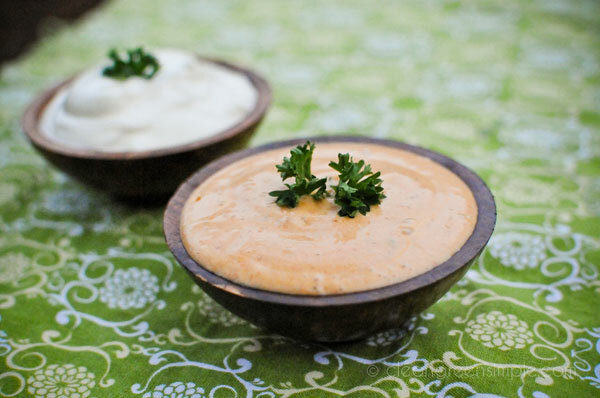 If to add a bit of oriental Sriracha sauce we can get an amazingly delish spicy vegan mayo. I just made this yesterday and it’s incredible! Thank you so much for sharing the recipe! 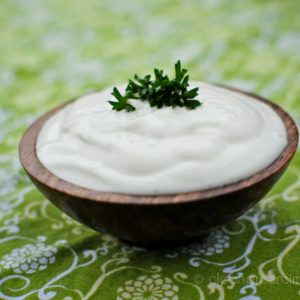 Hey Jessica, I googled “vegan mayo” today and made this at home. So, so good. I had light olive oil on hand, so that’s what I used, and it was delicious. I also love how easy it was to make. am going to make this soon. just one question jessica… doesn’t the mayo has the typical soy milk taste? No, it really doesn’t – the lemon juice, salt, and oil really cover the soy milk, at least in my opinion! Nobody I’ve served it to has noticed a soy taste either. I used Silk unsweetened for this recipe – the only completely unsweet soy milk I’ve found, at least in my area – and it worked wonderfully!! I’ve been a mostly-vegetarian for quite some time, and only recently went vegan – truth be told I’m still agonizing about whether to eat the meat-industry byproducts I have (poor college kid, people give me a lot of food, not stuff I would buy otherwise) so they don’t go to waste or just call it a wash and toss them – and I’ve been wracking my brain about what I’d do for mayo – I can’t afford the pay-for stuff, and I don’t trust the recipes that call for the use of tofu – tried that before, tasted fine but the texture was just not right. I am SO glad I found this recipe, SO glad it is so simple and uses ingredients that just make sense for a mayo – and, above all, I am SO glad it tastes SO good!!! Thanks! I’m going to link back to this from my blog, and also try to tweak it some (use sweetener instead of salt) to make it like a fruit dip! Thanks again!!! OMFG!!! I just made this, like, two minutes ago. I’m still going back to the jar to taste it because I can’t believe how much it tastes just like normal mayo!! and it’s so simple!! I’ve kept it for 2-3 days but it could last a lot longer, I just usually only make a little at a time so I’ve never tried it beyond that – let me know if you test it for longer! Kroger stores now have a plain soy milk and so does soy dream. Hi! I used this recipe as a guideline, but had to make quite a few adjustments to it- I’m on an elimination diet and can barely have any ingredients throughout the day- and through the process found out I’m allergic to soy. So soy milk was out, but I first tried coconut milk, thinking it’s thick enough, but nope. I realized after 3 attempts that carton coconut milk would be too thin, so I grabbed 2 cans of it and tried that with my grapeseed oil, mustard, salt and lemon juice. With the thickened milk near the top of the can I got MUCH closer tonight- and the flavor is dead on! The consistency is still pretty thin, but I’m hoping it sets up after a little while. If not, I’ll try again with a bit more grapeseed oil. Thank you so much for this recipe- what a difference in my daily life this will make! Yum!! I have been making this for months now! We’ve varied it a little to suit our own tastes, but we would have never thought of it if we hadn’t found your blog. I recently made a similar version with fresh basil and it was amazing and light, the perfect mayo for summer! I’ve made batches that last 1-2 weeks. I haven’t kept them any longer because they are usually eaten up by then! just made this, all of the ingredients were staples I already had sitting around, and it turned out delicious. I used powdered soymilk and apple cider vinegar instead of lemon juice. Took all of 2 minutes to combine all the ingredients in a jar and stick the immersion blender in. Don’t even have to transfer it to a different container! Love it, never buying veganaise again because this tastes just as good and it costs hardly anything!!! Good tip! I’ve made it with olive oil and it definitely has a very strong olive oil taste – I could see maybe using it in small amounts for very specfic recipes, but it is certainly not an all-purpose mayo! Tried this tonight and loved it! I added about a 1/4 cup fresh basil and three cloves of garlic for a dip for grilled veggie kabobs. Yum! This is a great recipe but it is NOT a raw recipe. The soy milks/nut milks are cooked foods. You can make your own raw nut milk to use in this recipe, or you could just use a raw nut butter thinned with a bit of milk (cashew or coconut butter or almond butter) but unless your milk is raw, this is a cooked vegan recipe. Very good however, thank you for sharing it. I am going to try it with sunflower oil and coconut butter or cream. I went to a vegan dinner last Saturday and some said it was easy to make your own vegan mayonnaise, that you basically had to mix soy milk with oil. I could hardly believe it would be this easy but still wanted to try and found out this recipe while searching on the web. Still, I found it hard to believe… until I tried! I mean, you have to know this: I LOVE my home made mayo and I’ve been making it for many many years. And I had big doubts that, even if the recipe would work, it would also taste nice, let alone taste like actual home made mayo. Oh dear, was I wrong!! This is absolutely bluffing and had you not told me it was vegan, I would never have tasted it (and I have to admit I kinda pride myself on my taste buds). Thank you so much for the recipe! It will be made and remade over and over! 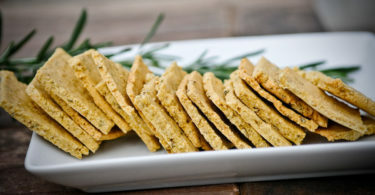 Can you make this with olive oil? So how did the almond milk turn out? Anyone try it with coconut milk? Hi- just came across this & I am gonna try it tomorrow. I have 1 question, can the recipe be cut in half & still come out awesome? Did you find something that works without soy milk? I want to try this too but without the soy! I made it the first time with olive oil, without sugar or sweetener and with 1/2 lemon and 1/2 vinegar. It was really thin and I tried blending slowly and then blending to the max. Still thin. I dumped it and started over, but used Grapeseed oil this time. Same thing as above. Too thin! grrrr. So I came back here and someone mentioned it could be the soy milk too think itself. I make soy milk from powder, which is much more economical here in Costa Rica and so I started adding more powder while it was blending. It took quite a bit more to get the consistency of the mayo I’m used to, store bought with animal ingredients, but in the end I love it! In a medium bowl, combine garbanzo beans, mayonnaise, mustard, relish, chopped green onions, salt and pepper. Mix well. I don’t think that will work, unfortunately. I am looking into alternative milks and will update this post when I do! I added a dash of garlic powder, and it was fantastic! Thanks for the recipe! Thanks for the recipe. I’m going to try coconut oil. How long can I store this in the fridge before it gets bad? I tried this recipe with canola and it was pretty runny. I used a food processor. Any suggestions? So easy to make and my husband cannot tell the difference between this and expensive store bought vegan mayo. 5 stars aren’t enough!! Thought you might like to try an SLT. Toasted sesame seeds in place of the bacon taste almost the same as bacon. Obviously they are much healthier too. You can toast up a stash of sesame seeds in a dry frying pan, just keep stirring. They will pop a bit and some of them will darken. You can add some salt at this point. You will want to dump some on the mayo to make them stick in the sandwich. Sesame lettuce tomato sandwich. Toast up several cups and store them in an airtight jar, they seem to keep for months…. This was great!! I am new to your site (thank you HuffPost!). I just became a vegan and your site has many of my favorite foods done in a way that will make my Doctor VERY happy. Would it be possible for you to provide calorie info on your recipes in the future? Made it yesterday. It is delicious and tastes like real mayonnaise. Much better than the vegan mayo made with silken tofu we tried a few weeks ago. woop! This became so damn awesome! I did try first with oat-milk, but it failed horribly. So after reading the comments here I tried with soy milk and it became just right! Tomorrow tikka masala burgers a la delux! Thank you! I still can’t believe that this worked, and so well! I feel like I just performed a magic trick in my kitchen 🙂 I used Silk Original and it turned out amazing! Thank you so much for sharing! I am going to be trying this today. I Have been looking for an alternative to Veganaise because I am allergic to rice and this is perfect. I will let you know how it turns out. I loved it!! I made the mistake of adding the salt first before tasting and it was very briny when I got done, solution, just added more oil and ‘milk’ in the same proportions, ran out of soy but had some almond milk and it worked beautifully! I won’t put any salt in next time and then may possibly add a little at the end to taste if even needed. Super fast and easy and I was able to make it with ingredients I keep on hand in the house. LOVE IT!! I gave you 5 stars! I’m a big fan of your vegan ranch dressing as well and always make sure to have a fresh batch around. Thank you and keep up the awesome work! thanks so much for this recipe! i made it and its soo good to finally have vegan mayo (i eat kosher and none of the store bought vegan mayos were kosher) and its soo simple i love it ill for sure make it again! Trader Joe’s has unsweetened soy milk, too. i have a question, in what proportions would you add the soy milk and oil. and can i use regular vegetable oil or even olive oil? I am so glad you published this great idea – vegan mayonnaise based on soy milk and oil. You can tell that I used vanilla soymilk (the only soy I had on hand) but this was amazingly easy and with some tweaking I got it to taste right despite the vanilla. Thank you!! I made this yesterday for a coleslaw recipe and it turned out perfect! Tastes just like veganaise but cheaper! Thanks for the recipe! Depending on your recipe, adding a bit of garlic/onion powder, salt, or other spices can mask what little bit of soy flavor there might be – also playing with different brands of soy milk, some have a stronger flavor than others. I like Westsoy Unsweetened and Trader Joe’s Unsweetened. What is missing in the Vegan mayo recipe? It’s all a bunch of liquids, so what makes it not like water? I tried this but after a while the mixture curdled and the oil rose on top 🙁 I added some cornflour but the problem remained. Re the taste is wonderful. Hi thanks for your recipe, so easy and quick and yum!I am in NZ and I used Vitasoy Soy Milky Lite (Australian brand)and that worked perfectly for a light option if possible for anyone. So mad this dosnt work with almond milk! Its the only milk I have, otherwise I would whip this up right now! Thanks so much for the recipe! I hate the price of veganaise! I’ve been making this with flax seed oil to make it more nutritious and it works well and tastes great! This really is a wonderful find. THANK YOU for posting. I have added to this recipe a couple of tablespoons of silken tofu. Fabulous. I will NEVER opt for store-bought vegan mayo again. I also ran into trouble due to substitutions. Hemp milk must not be as thick as soy. On hand, I had some Japanese arrowroot and I threw some of that in. No luck. Then I tried a few cashews (since I was using a Vitamix). Nope. Some oats. Still no. Then I found a can of cannelini beans and that did the trick! Tastes great, too! Thanks! Thanks Jessica! I had great success with it. I had to use 1.5% light milk though because I can’t easily find soy or almond milk here in Turkey. It’s also 3 times more expensive than the US. I added 1 tbs corn starch for extra consistency. No one can tell this mayo does not contain eggs. Delicious! I made it and i love it it was so so so easy!!! I added garlic powder. just a couple questions. how long does it keep in the frig? and can i put it in a jar with a metal lid? Looking at the recipe I was also concerned that it would be too runny, so I added about 1-1 1/2 tbsp ground flax seeds to thicken it up and it turned out perfect – just as thick as real mayo! It tastes so similar too! Thanks so much for the great recipe! Thank you very much for sharing your recipe. I’m going to try it tomorrow with your portobello burgers recipe. I have been following a similar recipe for years. Sometimes it comes out thicker and other times it comes out thinner, more like salad dressing consistency. I just used unsweetened coconut milk and ended up adding some tofu and it thickened it up just right. The flavor is always good—similar to vegenaise IMO. Thanks! You are a genius! This is amazing! Made mine with canola oil and westsoy unsweetened soymilk. It tastes like Best Foods. I am in shock and can’t wait to use this on everything- Thank you! Thank you! I have been thinking of finding a vegan mayo recipe for a while now, but haven’t until tonight. Yours was the first to pop up and I am excited to try it! My daughter is allergic to almost everything (even lettuce, onion, mustard…. you get the idea) and we can’t buy many prepared things from the store. I promised her I would try making this tomorrow while she is at school and now she won’t stop talking about “her” mayo. A million times THANK YOU!!! Thank you so much! Just had the most home-made vegan meal ever I think, I had your wonderful mayo on a coconut bacon BLT. So proud of myself for making the “bacon” and the “mayo” despite how simple they both were! FWIW I am in the UK and I used Aldi unsweetened soy milk which worked. I thought it wouldn’t until I added the vinegar and then pow, mayo. Hi I just found this recipe and want to try it– how long will it stay good in the fridge and can it be frozen? It stays in the fridge for a few days, I wouldn’t recommend freezing. Have just made this using cider vinegar and I am amazed. It was really quick and easy. And it tasted alright as well. Thank you for the recipe, I had been looking for a nice tasting, easy to do recipe. I made this with almond milk and it worked great., but added the oil in slowly at the end instead of the vinegar. When I tried it adding vinegar in last, it got runny. I have better luck with it getting thick by drizzling just the oil in last. Not all sugar processors use bone char. You can use regular sugar and still be vegan if it is from a company that doesn’t filter with bone char. There are lots of lists on the internet. Or you can call the company and double check. I think it helps to call because it gets the word out that we are checking. I just went through almost a bottle of canola oil and milk which all turned to think when I noticed: it’s the food processor (in my case). I made too small batches for my food processor. When I only made a cup the upper blade wouldn’t blend it enough and it would all just fly around in the processor. When I noticed this I made sure to make a batch that covered both blades. Turned out perfect. Now I know why this recipe sometimes been a success and sometimes a disaster. I used unsweetened soy milk (Alpro, red). MY MOTHER USED TO MAKE MAYO THE ORIGINAL WAY WITH THE EGGS AND I THOUGHT THAT WAS GREAT. BUT BEING A VEGAN AND GETTING THIS RECIPE IS ABSOLUTELY GREAT! I DON’T EVEN HAVE TO MAKE IT I KNOW IT TASTE GREAT. BUT DON’T GET ME WRONG I CAN’T WAITE TO MAKE THESE RECIPES AND THANK YOU EXTREMELY MUCH FOR SHARING. Didn’t work. And i used a looooot of cornstarch, still as liquid as ever. Perhaps it’s the blender, perhaps it’s the rice milk; who knows? An indicator for a thicker milk/cream would have been helpful, just needed to point that one out. The way to get this to emulsify is to add the oil slowly, not all at once. If you dump all the oil in at first you’ll just get a runny mess. I used almond milk (unsweetened) and it works fine. Also, if you use olive oil it will solidify in the refrigerator, creating a nice thick mayonnaise. After reading all the comments I set out to find a thicker vegan milk. We’re lucky here in New York there’s a company Green Rabbit that makes a product called MimicCreme. It’s made simply with almonds, cashews and water, used primarily as a coffee creamer- in a tetrapak. It’s a little expensive but all said the mayonnaise is half the price of premade- and tastes better. There’s an unsweetened version and it worked perfectly for this. Also took the suggestion of using an immersion blender in the jar used to store it. No muss no fuss. Love this recipe! Have modified it many different ways for different uses. Wanted to make 2 helpful comments on the comments of others. First, for those who try it and it comes out runny. The first 2 times I made it, it was perfect. The 3rd time, it was runny. I added a splash more soy milk and it firmed right up. Second, for the question about freezing. I cannot use enough soy milk before it spoils, so I froze it in 1/2 cup containers. This prevented the soy milk from thickening when I used it, so I added about a 1/4 cup of soft tofu. Oh my! It made it so thick and delicious! It really added some body to the mixture. The only other comment I would make is to be adventurous! I have found some particularly delicious mixtures using basil, garlic, True Lemon. And I always include about 1/8 cup of toasted sesame oil to which ever oil I use each time (olive, grape seed or canola). Thanks again for this great recipe! I had the same question then I thought to My guess is it lasts as long as the most perishable ingredient. However I am not sure how the other foods will affect this item (likely the soy milk) but I wouldn’t go longer than it lasts on it’s own.. Maybe a few days in advance in case the other ingredients cause degradation to the molecules. I just wanted to tell you that I tried this, and it is so yummy and easy. I used the grape seed oil and prepared mustard options and it turned out very rich and creamy. It was more yellow due to the prepared mustard. I also wanted to mention that I tried Kathy’s SLT by toasting sesame seeds and OMG, did they mimic bacon. Thank you both! what is the shelf life vegan mayo recipe? I bet this recipe is delicious! Sounds amazing. But just FYI, soy milk isn’t considered raw. It’s kinda misleading. And the oil used should be cold pressed or expeller pressed for it to be considered raw. Thanks for the recipe! Hi — I tried it with almond milk. Tastes fine, but it doesn’t “puff up” to Mayo. I’m thinking maybe, it will be a good base for salad dressing, so no big deal. Maybe 1000 Island? Thank you!! I am not a vegan but food allergies have made us look at so many different things, we would have never considered before. I did add a bit of black pepper and some sugar (that’s what my mum used to put in her homemade mayo) and I went a bit overboard with mustard, but all is GOOD!! Now of to make your egg free egg sandwiches!!!!!!!!!!!!!!!! Thank you, thank you, thank you!!!!!!!!!!!!!!!!!!!!!!!!!!!! !